Who doesn’t recognize the experience of looking for a workspace to work, study or to have a meeting with someone, but all of the seats are taken? It doesn’t matter how early you arrive at the office building, most of the workspaces are occupied, which results in an endless search for a desk or meeting room somewhere else. The question remains; will there be a free workspace in another building? Jan, a civil servant working in The Hague, emphasizes this problem and says to the Dutch daily newspaper Algemeen Dagblad “You get the feeling of competing in a jostle to obtain a spot, there are always less seats than people. If you are too late, no workspace will be available”. Evalan and Arend van de Stadt, innovator in vision systems, developed an IoT-solution to address this problem: SmartEagle. SmartEagle monitors workspace occupation. The device is trained to recognize objects such as laptops, cups and people. In this way the system detects whether there is a colleague in the room, not focusing on who is actually there and in which workspace they are: the data is fully anonymized. There are three statuses: Free, occupied and sign of life. 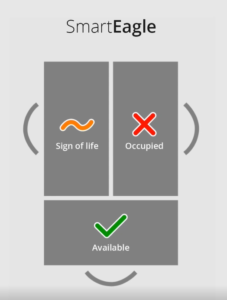 The last one means that SmartEagle recognizes whether there are any personal belongings in the workspace to indicate that the person has temporarily left the workspace but is still using it. By means of a helicopter view of the room, the system detects the workspace occupation and transmits the data via the cloud to a smartphone or other interfaces. SmartEagle can be installed as an extra functionality of the smart building solution bGrid. This solution consists of a wireless sensor network that measures the lighting and temperature in office spaces. Employees can manage the lighting and temperature via an app. The IoT-solution offers an extra option in the bGrid-system. SmartEagle can also be used as a separate system. SmartEagle simplifies the process of looking for a workspace. Besides this, the facility manager gains insights that lead to more efficiency and less costs. Questions as ‘What is the percentage of occupied workspaces?’, ‘Are there too many or too few spaces?’ ‘Can I clean more efficiently?’ and ‘Is it possible to rent fewer spaces?’ can be answered with SmartEagle.